Mangroves grow quickly, but rehabilitated forests must be appropriately managed to prevent renewed deforestation from shrimp farming and fuelwood collection. Mangroves form a rich and diversified ecosystem on which coastal dwellers in the Mekong Delta of Viet Nam have depended for decades. The mangroves have provided local people not only with food (fish and shellfish) but also with timber, charcoal and fuelwood. Mangrove forests offer food, habitats and reproductive grounds for many marine species and several terrestrial animals and birds. During the Viet Nam war, mangroves in the south provided strong resistance bases for Vietnamese people. 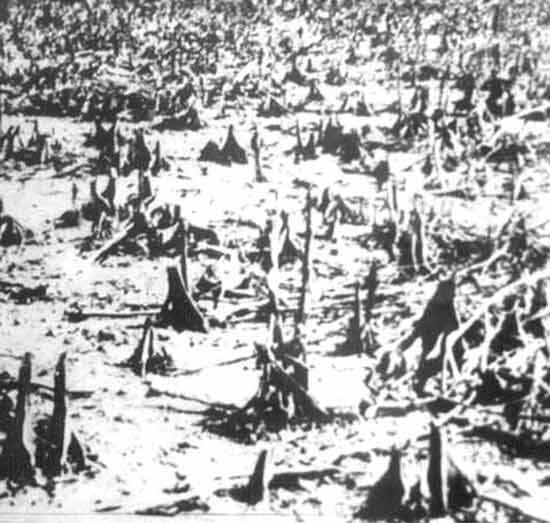 Consequently, the foreign military used bombs, cannonfire and toxic chemicals (herbicides and defoliants in high concentrations) to destroy the forests. The principal herbicides that were used include "agent orange" as well as white agent (mainly to destroy forest trees) and blue agent - chemicals that kill the forests. Of the total mangrove area in southern Viet Nam of 291 000 ha, 105 000 ha or 36 percent were sprayed one or more times. A large part of timber and other resources in mangrove areas were lost. Forest soil was chemically changed because of the loss of protective vegetation cover, with lower pH from insufficient freshwater in the dry season and higher salinity because of increased evaporation. Without the protection that mangroves offer against tides, waves and water currents, severe coastal and riverbank erosion occurred. For a few years after the defoliant spraying, fish, crustaceans, molluscs and other aquatic resources increased in number as decomposed leaves from fallen mangroves created abundant food in water. However, they later decreased rapidly when no mangroves remained. After mangroves were destroyed by herbicides, some species such as crocodiles and tigers became extinct. 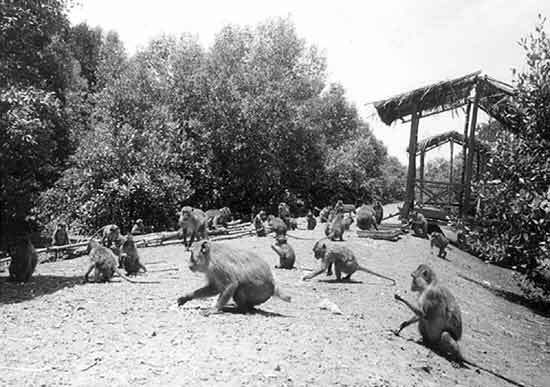 Monkeys, lizards and birds, which used to be found in great numbers in mangroves, also decreased gradually after the war. Added to the direct effects of mangrove loss were the indirect impacts on the livelihoods of people who depended on the wildlife and other forest resources. Between 1978 and 1999, some 21 400 of the original 40 000 ha of mangroves were rehabilitated in Can Gio, a district of Ho Chi Minh City in southern Viet Nam. Before the war, Can Gio had about 40 000 ha of dense mangrove forests, but by 1971 they had been almost completely destroyed. From 1972, some mangrove species regenerated naturally in areas flooded by tides, but because of a lack of cooking fuel the mangroves were destroyed by the local people. In 1978, aware of the significance of mangrove ecosystem rehabilitation, the People's Committee of Ho Chi Minh City invested in reforestation. This was undertaken by the City Forestry Service and the People's Committee of Can Gio District. to create habitats for terrestrial animals and provide nursery breeding grounds for aquatic resources. to supply part of the demand for fuelwood and poles. The main species planted were the fast-growing Rhizophora apiriculata (the main economic species) and other species such as Nypa friticans, Ceriops tagal and Rhizophora mucronata. From 1978 to 1994, 18 120 ha of R. apiculata and 1 031 ha of Nypa palm were replanted. The reforestation in Can Gio was mainly done by youngsters and schoolchildren. Consequently, the technical aspects of reforestation were neglected and the survival rate was low. In the first years of the R. apiculata plantation, because of the lack of experience, the planting density was too high. Of the 29 583 ha of R. apiculata planted in Can Gio from 1978 to 1989, only 18 125 ha were covered with mangroves at the beginning of 1990. Through the 1980s, the success rate of the rehabilitation was limited by inadequate management, continued fuelwood collection and conversion to shrimp ponds (see section on management and protection, below). By 1996, nearly 35 000 ha of mangrove forest had been replanted in Can Gio; of these, about 20 000 ha are now growing well. The mangrove flora is now fairly similar to that before the herbicide spraying, although the amounts and distribution are not the same. There are 72 mangrove species reported, 30 of which are true mangroves (species that can only grow in areas inundated regularly with tidal water, even if only once a year) and 42 associated mangrove species. Besides the mangrove flora, 95 species belonging to 42 families of inland plants dispersed by humans and animals have been found. Today, the mangroves in Can Gio are more diverse in community structure than before the war. An explanation for this is that in these mangroves, replanted species have mixed with naturally regenerated species. The rehabilitated mangrove forests in Can Gio have reduced erosion of river banks, and large tidal sandy mud flats have formed for benthos habitats and shell and clam farming. Mangrove rehabilitation has changed the soil properties because of sediments formed by litter fall with the help of large quantities of fine and fibrous root matter. The substrate has been gradually transformed into loam and the pH value has subsequently increased. Mangrove rehabilitation has contributed to protection from storms and reduction of salt intrusion in the agricultural production areas of Can Gio and neighbouring districts. Rehabilitated mangroves act as filtering systems for air pollution and for the waters of the estuary, trapping sediments and preventing solid waste from Ho Chi Minh City from discharging to the sea. Birds have an important role in the ecosystem, contributing actively to the enrichment of food sources and the soil. From 1975 to 1980, birds were very rare in Can Gio mangrove areas. Since the 1980s, an increasing number of birds have come back to the area. Besides waterfowl, migratory species from the north, such as Numenius arquata, Tringa hypoleucos and Charadrius dubius, appear in large numbers in winter. Many shore birds such as Phalacrocorax carbo, Centropus sinensis, Egretta garzetta, Egretta alba, Threskiornis melanocephalus, Plegadis facinellus and Dendrocygna javanica are present on the mudflats. Among the terrestrial mammals, after mangrove restoration, the species with the most numerous individuals in the mangroves is the macaque (Macaca fascicularis), which lives in troops of 30 to 40 along the rivers and canals. Groups of wild boar (Sus scrofa) are abundant in Phoenix paludosa patches. In the 1980s, the replanted mangroves were not appropriately managed. A Forestry Enterprise made up of a small group of forestry workers, with insufficient means of transport and communication, was responsible for the protection of a vast area. Local inhabitants and nearby coastal dwellers, under economic stress, destroyed newly replanted mangroves through overharvesting for fuelwood and conversion to shrimp ponds. By the end of 1989, however, owing to the young age of the forest, many collective farms and villages could not cover management costs; hence they returned the land to the People's Committee. These areas were left largely unmanaged, becoming an open-access resource threatened by overexploitation. In May 1991, the government approved a project for the environmental protection of the forests of Ho Chi Minh City, and the People's Committee invested funds and proper equipment to protect the forests. The Forestry Enterprise was converted into the Management Board of the City's Environmentally Protected Forests (MBCEPF); personnel was increased and the city put into practice a policy of land and forest allocation to households. As a result, the destruction of forests markedly decreased. Activities in the forest are now monitored and recorded. The main guard force includes workers from MBCEPF, workers from the agroforestry enterprises, employees of the Forestry Agency and households allocated forests to protect under 30-year contracts with MBCEPF. To date, 10 850 ha have been allocated to 208 household guards. The guards are given monthly salaries, 35 percent of the forest produce from thinnings, an allocation of 3 to 5 ha per household for aquaculture or salt ponds, assistance with difficulties and rewards for good protection of the forests. Other benefits to households include money to build houses on allocated land, boats for forest protection, loans for authorized fisheries production, and technical help through short training courses on thinning, reforestation and shrimp farming. These activities have been repaid: at the beginning of 2000, the Can Gio mangroves were designated for inclusion in the United Nations Educational, Scientific and Cultural Organization's World Network of Biosphere Reserves. From 1998 to 2001, ecotourism in Can Gio has developed rapidly. The troops of macaques, reared crocodiles and other wild mammals in the protected Can Gio Forestry Park have attracted many tourists. The development of ecotourism has been contributing to the socio-economic improvement of the local community. Compared to many other localities in Viet Nam, Can Gio has large and well-protected replanted mangrove forests. However, there are still constraints and problems that need to be addressed. Apart from the households that have been allocated land and forests, the life of local farmers and fishermen is still difficult, and the awareness of the local population of the role and worth of mangroves is still low. Shrimp and crab rearing is highly profitable, and some households still destroy mangroves to build ponds. The demand for timber, poles and fuelwood is far larger than the supply from thinnings. As the resources of the inland forests are insufficient, people in other districts or provinces still come to the mangrove forests to remove trees illegally. Hong, P.N. 1996. Restoration of mangrove ecosystems in Vietnam: a case study of Can Gio District, Ho Chi Minh City. In C. Field, ed. 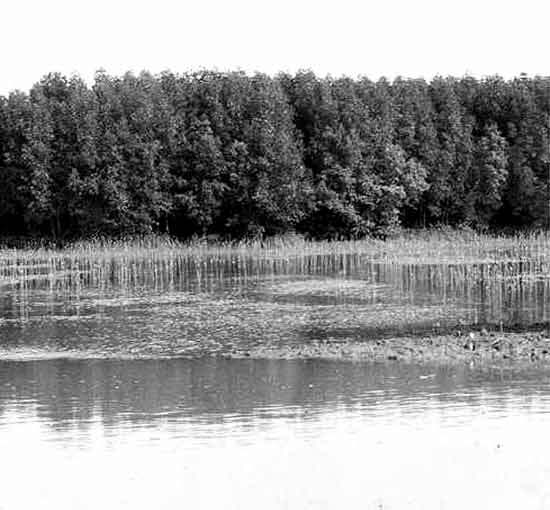 Restoration of mangrove ecosystems, p. 76-79. Okinawa, Japan, International Society for Mangrove Ecosystems and International Tropical Timber Organization (ITTO). Hong, P.N. 2001. Severe impacts of herbicides on mangroves in the Vietnam war and ecological effects of reforestation. Paper presented at the Centre for Excellence (COE) international seminar "Changing People-Environment Interactions in Contemporary Asia: An Area Study Aproach", Kyoto, Japan, 15-17 November.